DAG-based blockchain payment platform 'COTI' officially introduced its trustchain protocol code to GitHub. COTI is a next-generation blockchain payment platform that was established to solve current problems such as low expandability, high commission, and insufficient measures for protection of consumers of blockchain technology. It boasts blockchain network that can be trusted by participants, low commission, and fast agreement time that corresponds to tens of thousands of TPS through its DAG-based trustchain protocol without block generation. 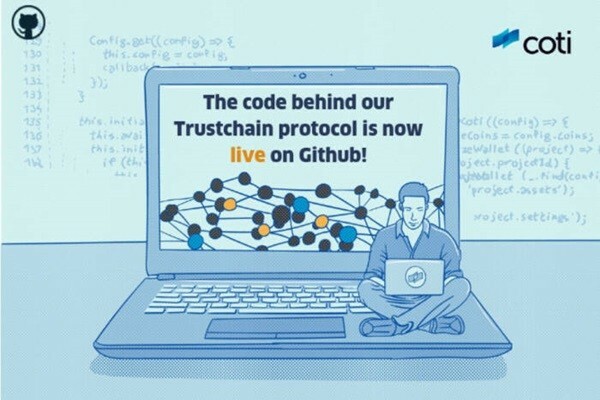 Its trustchain is an innovative trust-based agreement mechanism that provides incentives to induce every user to establish types of 'trust' within DAG environment. COTI's DAG distributed ledger increases expandability through parallelization and trust score. To earn transactions faster from COTI's proof of trust agreement mechanism, high trust score is a must. Because a new transaction is verified along with two previous transactions with similar trust scores within COTI network, higher trust scores receives faster transactions and low fees. Also, COTI has its own unique proof of trust algorithm that adjusts participants' incentives and prevents spams. COTI also applied principles of its trustchain to its arbitration system that solves conflicts that occur during transactions. COTI is planning to provide end-to-end solution to franchises, governments, financial organizations, and developers that need its blockchain payment network and coins that minimize variability of price. It is planning to introduce decentralized blockchain payment network called 'COTI Pay', which is based on its trustchain infrastructure, and 'COTI Dime' token that sets up stable price through fixed price ($0.10) within COTI Pay sometime during this month.